Caught the tail end of this awesome documentary on origami, highlights include bits on origami protein folding and the French avante garde origamists(?) Le Crimp. Today I went to a Chicago cafe, like I so often do, to try and accomplish some work. Telecommuting has its many advantages, but after not leaving the house for 3 days straight you just gotta get out. Anyway, with a strongly brewed organic earl grey in hand, I found myself without internet. Unfortunately this happens all the time in Chicago, making it one of the top 10 unreliable cities for public wireless connections (a statistic I just made up). Secretly, I kinda love when this happens though. I put my computer away and trade it for a mini notepad to jot down some thoughts. I find myself overwhelmed, like a lot of people, with the amount of tech that we deal with on a daily basis. Computers are great and all - but in my opinion we reached the height of computer usefulness around 1999-2000. That's around the time when computers graduated from nerdy tool to fashionable, low-cost social accessory. Anyway I won't digress too much, but in short I think when a technology "overfunctions" (functions well beyond your need) it tends to have a negative effect on productivity/life, as a result of overwhelming feature shock. Too many things it can do, infinite options, infinite possibility, infinite distractions! You can never master and overlearn it, because there are too many features, making it difficult to achieve and experience flow. To be clear, I'm not a techno-curmudgeon - I just think computers should adapt to the way we work and not the other way around. One of the exhausting things about the internet is the amount of information that must be conveyed through text. It can be a frustrating medium for emotive communication. The. awkward. period. Ellipses... :D LOL I'M EXCITED AND LAUGHING!!! ~~|?|><:) Imagine if you had to do that in real life - "Hey man! I'm laughing out loud right now! Are you there? I'm sad now, because it is raining. Now I'm experiencing a complex nostalgic emotion because of the smell of this food!!!! LOL!" Communicating online is pretty taxing, and I think sites like Twitter and Tumblr are popular because they split things into more manageable chunks. Leave it to others to piece together the fragments and figure it out. Picture, link to funny video song, 140 characters about where I am. Little micro-updates firing into the air in all directions, breathe it all in, blink, and try and create a subconscious impression of the person, what they are doing - how they are feeling. In real life you look at somebody and without words you can read body language, hear the tone of someone's voice, smell what they are smelling. There is shared communication and shared experience, even with the stranger sitting next to you. Not any effort involved...your brain just absorbs it all subconsciously. So is microblogging and twitter updates satisfying a human need? I dunno. People have an obvious desire to share things, and keep in touch with friends. I think it works best in this utilitarian way, much like a phonebook or bulletin board. But achieving a full emotional experience by summing small bits of video, text, and audio together seems incomplete. No matter how much emotive information I glean from my friend's twitter feed, I'll never really feel their full presence. But it doesn't stop me from trying, because it is addictive as hell to try. Anyway thinking about all of this, I thought it'd be interesting to try and experiment with communicating with no words, and use *only* images, audio, and video that I create. The exception would be that it'd be ok to post a photo of something handwritten. Instead of explaining what things are all the time (metadata), just let a picture, video, or audio clip speak for itself. No titles, posted dates, hyperlinks, not even a caption - no automatic documentation of any kind. A pure stream chronologically listed, left to interpretation and blurry memory. Sounds kinda liberating to me, and challenging. I may try that out here, at least for a little while! 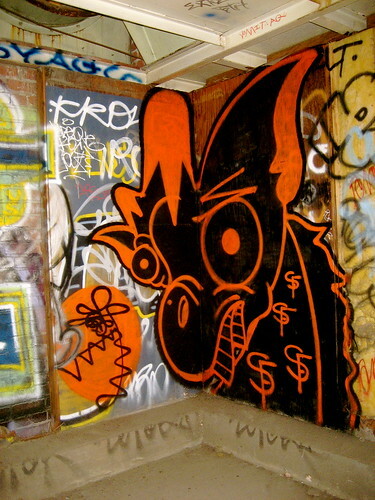 Police Arrest Graffiti Artist "Girafa"
Usually Hype Machine tends to promote dance remixes and indie tracks. I was really surprised to hear something this dynamic and good. Check it / favorite it on hype machine if you like. I don't know anything about the artist, but I'm intrigued. Sonically rich, full of interweaving textures. For some reason I don't want to say ambient, even though I'm sure that is what most people would lump it into. It just feels a little too involved to be straight up ambient. Q4 is a really cool venue just north of Humboldt Park. I will be playing at this event this Sunday, which sounds like it'll be a lot of fun. Live Art, DJs, and tons of music to wobble your eardrums...Oct 18!!! Don't miss it! Just an FYI I'll be playing two shows in the next two weeks (just booked em today). One is this upcoming Monday (very, short 5 min set), and the other one is the following Monday (longer set). Mark your calendars! After bouncing around places for the past year, finally moved to a new apartment farther north in Chicago. Thai, Pakistani, Indian, and all sorts of good eats are in the area, and we live within walking distance of several cafes / train / record shops / and a movie theater. One of the things that sold me on the apartment was the farmer's market that is held every Tuesday about a block from where we live. Finally went today and for about twenty bucks I walked away with a ridiculous amount of produce, including some raspberries. I *thought* I knew what a raspberry tasted like until I tried these. There is a certain aftertaste and flavor that is straight up MISSING from store-bought raspberries. Highly recommended. So after some futzing I swapped out the stem, but the brakes were really messed up. I had to take it to another (better) shop to fix the previous guy's shoddy work, argh. But even with the goofup I still stayed under my budget, so it worked out. I don't mind the friction shifters for now but might swap it out for an internal hub some day. Haven't been giving this site enough love as of late...since about mid July I've been kinda hooked on the Facebook / Twitter scene. Not that I'm posting that much really (I don't even own a twitter account) but I have noticed I get more info about what's happening with people I know through these sites. But those sites definitely feel like socializing in a bar, whereas this site feels a little more like home. I could see myself being more engaged in social networking sites except I feel like I already spend too much time online. And I also have this nagging feeling that where now it feels like we still have a choice whether or not we have to participate in online networks, in the future I can see it being pretty much full blown social pressure. Kinda like how if you don't own a cell phone now you are almost off the grid. So I'm kinda biding my time until that pressure ratchets up (I think it already has), and I'll be involved anyways whether I like it or not. Also I've noticed the average length of text messages I'm receiving from people has increased. I think it could be more reliance on text messaging to send greater amounts of information and also just that more people I know have smart phones and can type faster. Me, I'm still trying to tap 3 times to get the letter "z". Again, biding my time till the inevitable purchase of a smart phone. I heard somewhere that younger kids have anxiety when they AREN'T able to access online networks. This should be surprising, but isn't really. I feel like the more you engage with lots of people online, the more touching human interactions can occur and then when you take that away of course you feel disconnected / detached without it. And you start worrying that you are left of the loop, that you don't know what your friends are up to, that they'll think you are ignoring them, people might be worrying what happened to me, etc.. This seems like a recipe for addiction / dependency. I already know that my online habits have a tendency to get fidgety and compulsive - I check my email over and over or check the same website over and over - so tapping myself into a broader information stream could be pretty overkill. The Iranian election was the first time I've ever been glued to a twitter feed, constantly refreshing it and sifting through it for real information...and that was *incredibly* draining. I think I did that for about a week or two weeks straight and had no mental energy left to do much else. Rumors, speculation, truth, lies - it was all coming at once at 1000 tweets a second. Too bad the proposal Eric and I wrote didn't get accepted. It was conceived as an absurd joke but it feels more relevant every day. I wonder if other people know this feeling I'm talking about, the drain of spending too much mental energy filtering through a wealth of raw data. It's completely different than trying to cram for a test or studying a wealth of knowledge for some purpose or goal. It's more like a million people trying to tell you something at once and feeling an incredible compulsion and urgency to decipher it all. Afterward you wonder if the information you've learned is even that important and if it could have waited till tomorrow.